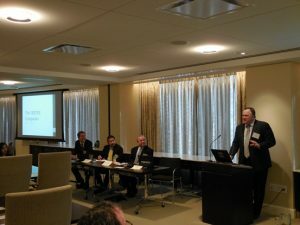 On Tuesday, November, 25th, VERTEX’s President and COO, Jeffrey Picard, served as a panelist for an event hosted by the New England-Canada Business Council focused on discussing the future of North American Economic Competitiveness. Other panelists included Aaron Annable, Acting Counsul General, Consulate General of Canada; Daniel Hernandez-Joseph, Consul General, Consulate General of Mexico; and James Paul, Director of the Boston Office of the U.S. Department of Commerce, International Trade Administration. The event was well attended and offered excellent discussion and insight into the past 20 years of NAFTA’s work with Canada, the United States and Mexico. Panelists were able to give their views on country specific experiences and vision of North American trade moving forward.